Remy is a rat, constantly risking life in an expensive French restaurant because of his love of good food, as well as a desire to become a chef. Yet, obviously, this is a rather tough dream for a rat. But opportunity knocks when a young boy, who desperately needs to keep his job at the restaurant, despite his lack of cooking abilities, discovers and partners the young Remy. 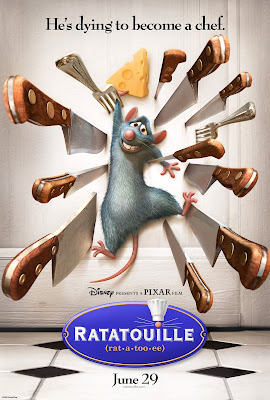 Its up to the two of them to avoid the insane head chef, bring the rest of Remy's family up to his standards, win his partner a girl, and, of course, produce the finest Ratatouille in all of France. All of my friends know that I'm terribly afraid of rats, but I am going to make one exception for Ratatouille. Remy doesn't look so bad, plus he's French... of course.